The Pictures above are my two hybrid hamsters =) Rodeo and Snookie! The first picture is Rodeo.He is a hybrid specie. Specifically, he is a Russian Dwarf hamster.The second Picture is my hamster Snookie. She is also a hybrid specie. She is specifically a Argente Camble Dwarf hamster. These species of hamsters are *VERY prone to diabetes. So it's very important to stay away from most fruits with these species.If you seriously want to give these species of hamsters fruit, click the link that I am going to list after this caption. It's a post on the Hamster Hideout Forum. It is very informational and will help you out! there will be more pictures of my animals after this caption.So go check it out! Here is the winter white hamster. The scientific name for them is Siberian. It is actually really hard to see the difference between this specie and the campbell dwarf hamster. There are specific marking that you need to notice to identify the two. The winter white hamster has three noticeable stripes that run down the back.It is a lot easier if you catch a winter white in it's white stage. Yes that's right,it's really not called a winter white for nothing! It actually turns a lot lighter during the winter time. Now don't get too excited...there's a catch. Winter whites *very rarely turn completely white during the winter. It's like once in a blue moon! Because in normal day houses, The lights are not natural like the UV light in the sun. The winter white hamster needs that type of light for it to turn its white color. Told you not to get excited! The Roboroviski hamster is the smallest hamster specie out of them all! they are approximately 4.5 centimeters or 1.75 inches long. Their life spand is about 2-3.5 years long.They are in fact the smallest species of hamsters out of them all! 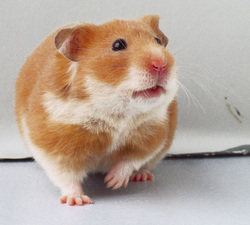 However just because Roborovisi (robo for short) hamsters are small and pocket size. They have their cons. Robo hamsters are highly active and jumpy. So robo hamsters are recommended as pets for kids that have experience of owning hamsters or kids over the age of 7. The Chinese Dwarf hamster is the only specie that has a longer noticable tail. Their live spand is usually 2-3 years. They can be classified as one of the many breeds that are prone to diabetes. So feeding them is a crutial part of owning them. (see hamster diets/foods) for more reference on feeding this species of hamster. They are noticably longer then most species. So sometimes if moms are curious, they might be mistaken for rats. So be sure to explain that this is a hamster but just has a longer tail. © Copyright Hamsterfanatic26 all rights reserved.